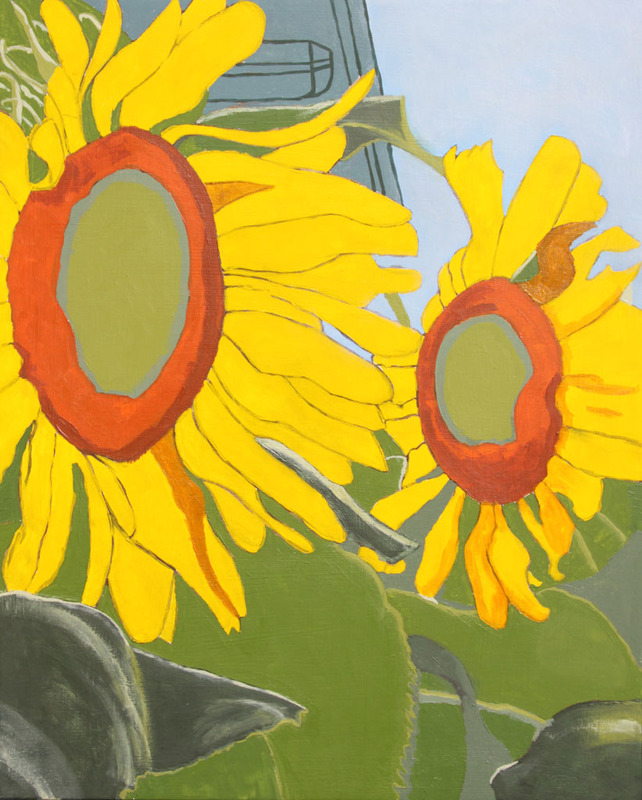 moneythoughts: Saturday Is For Art & A Sunflower T-shirt? Saturday Is For Art & A Sunflower T-shirt? As many of my readers know, Moneythoughts is sponsored by Ski Cincinnati, a wholly owned subsidiary of the holding company F.D. Zigler Artist. F.D. Zigler Artist is a privately held company not engaged in any oil drilling or coal mining. F.D. Zigler Artist is more or less a think tank that has been coming up with "dumb ideas" since 1942. Some of the ideas were turned into visual images and placed on t-shirts as early as 1981. Ideas of the political genre were first placed on masonite boards in oil paint in 1988-89. In 2009, F.D. Zigler Artist attempted to break out and do sunflowers (I was told that everyone loves sunflowers). 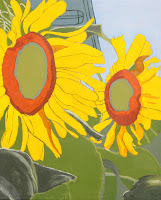 One sunflower painting was completed and another waits to be finished. The sunflower painting is now going to be adapted to t-shirts, or should I say attempted to be adapted to t-shirts. The silk screen process may turn out an attractive sunflower t-shirt, but that remains to be seen. The idea for this did not come from of the F.D. Zigler think tank, but was suggested by my silk screen printer. As we have some white t-shirts to try this on, why not. I did bring back another t-shirt design from the early 1980s - Chili Summers in Cincinnati. This t-shirt will be available later this summer if not sooner. I hope everyone has a safe and fun filled weekend. Art on a T shirt, I like that! Have a great Sunday Fred! Thanks for your comments to my blog. Feel free to join my small list of followers. I enjoyed seeing fields of sunflowers like the ocean to the horizon in eastern South Dakota when I biked across USA. When Is A Black Swan Not A Black Swan ?